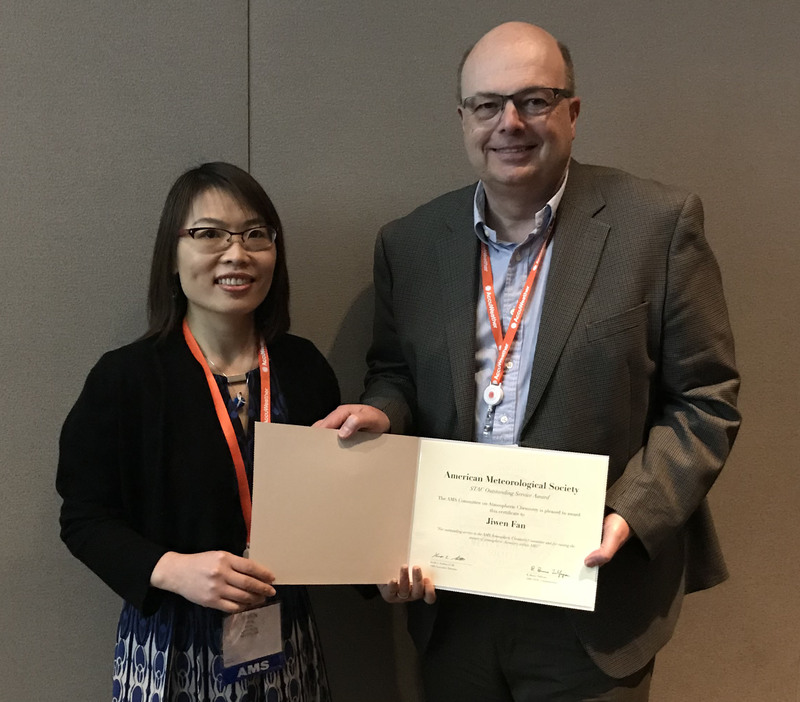 Jiwen Fan (left) poses with Jeffrey Collett Jr., current chair of the AMS Committee on Atmospheric Chemistry, and her STAC award certificate. Photo by Jonathan Jiang. Enlarge Image. Congratulations to Dr. Jiwen Fan, atmospheric scientist at Pacific Northwest National Laboratory. She received a Scientific and Technological Activities Commission (STAC) Outstanding Service Award on behalf of the American Meteorological Society (AMS) Committee on Atmospheric Chemistry. The award recognized Fan's significant contributions to promoting the atmospheric chemistry field within the AMS community, including her committee leadership and key roles in organizing conferences and symposiums. Fan chaired the AMS Committee on Atmospheric Chemistry for three years (January 2014 to January 2017). She was co-chair in 2013 and spent six years on the committee overall. The committee plans the Conference on Atmospheric Chemistry and the Symposium on Aerosol-Cloud-Climate Interactions, which take place each year as part of the AMS Annual Meeting. Fan organized or co-organized the Symposium on Aerosol-Cloud-Climate Interactions from 2013 to 2017. She co-organized the Conference on Atmospheric Chemistry from 2015 to 2017. Fan also helped plan the 2016 Mario J. Molina Symposium, named after a recipient of the 1995 Nobel Prize in Chemistry for ground-breaking ozone research. The symposium took place in January 2016 during the 96th AMS Annual Meeting. Fan received her award at the 2018 AMS Annual Meeting on January 8 in Austin, Texas. She was among nine winners in the first year of the STAC awards. The STAC consists of six boards and 30 committees, including the AMS Committee on Atmospheric Chemistry.